The Lindenwood Neighborhood has been blessed with a variety of public and private schools. Our September 2005 Newsletter featured a history of the Lindenwood School. Epiphany of Our Lord Catholic Church sponsors a grade school with an equally illustrious history. 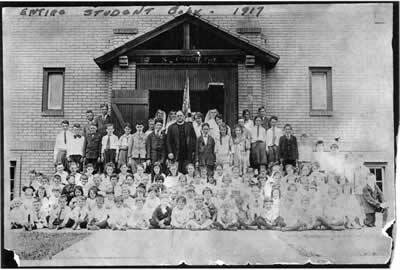 The school was opened in September of 1912 in an old “Nickel Odeon” on the spot now known as 3218 Ivanhoe. Sister Cecilia and Sister John Baptist conducted the classes — five grades, no kindergarden with an enrollment of 42 students. The sisters lived at Holy Redeemer Convent in Webster Groves and commuted each day to Epiphany on the Frisco Railroad. The original school building was used for Mass on Sundays but at 8:30 on Monday mornings, Sister Cecilia rang the bell and children came flying from many different directions. The playground extended over a six foot clay roadway now called Ivahnoe Avenue. The pews in the church had pads stuffed with cotton and when these pads were removed on Monday morning, the seats served as desks and the children sat on the kneeling benches. Heat was provided by an old-fashioned potbellied stove that had seen many years of service before Epiphany church inherited it. On very cold days, each class took turns around the stove. Drinking water was available next door at an outdoor hydrant. This house was vacant and the landlord allowed the boys to use the toilet facilities in an old fashioned builing of the “Chick Sales” variety. The girls used the same type of facilties belonging to the drug store which was operated by Mr. Philibert on the corner of Scanlan and Ivanhoe. This building has since been replaced by a brick tavern. The nuns went to the home of Mrs. Espy at 6721 Smiley for lunch every day. The students liked this arrangement because after sitting on the embankment in front of the Church to eat their lunches, they could run wild over the pasture across the road – always heading for the forbidden spot – a large pond which occupied the center of Bradley Avenue. A new building was ready by December 1912. The children were taught in two classrooms and the sisters lived in the other two. As enrollment increased, so did the need for more sisters and for more space. 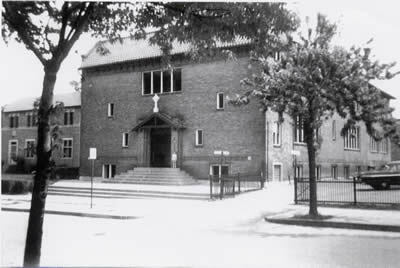 In 1915, the sisters’ living quarters, which were then located in the school, were moved to a house at 3129 Ivanhoe and their previous space was used to expand the school. 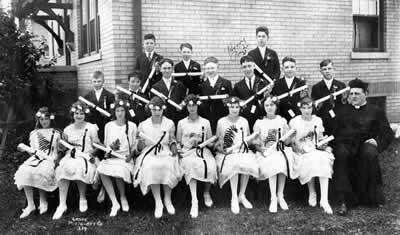 At the end of the 1930s, the school enrollment had reached nearly 400. Because the convent could accommodate no more than the seven sisters then living in four bedrooms, it became urgent to provide more space. Expanding the school meant providing more living space for the sisters. A rear west-side wing that included a chapel, four bedrooms and a bath were added to the convent. In 1953, both the school and convent were once more overcrowded. A second story was added to the first addition at the back of the convent. In 1958, a new school was built on a piece of property which lay behind the old school and the convent. The new school became inadequate again in the mid-1960s when enrollment peaked at more than 1,000 pupils. During those few years, some classes had to be held in temporary classrooms above the gymnasium. Epiphany School graduated its last class and closed its doors for the final time in May 2010 after ninety-eight years. Thanks to the Epiphany Church archives and Rosalie Heuing for their assistance in preparing this article.